Yesterday the news broke that Rudy Giuliani sent two unnamed attorneys to offer a pardon to Michael Cohen. That means Rudy committed felony obstruction of justice, which means if he wasn’t already going to prison for his past antics, he’s definitely going to prison now. 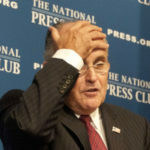 In response, suffice it to say that Giuliani isn’t taking the news well. For some time it’s been fairly clear that something isn’t right with Rudy Giuliani. He routinely sounds like he has a small fraction of the cognitive ability he once had. He’s also apparently lost every bit of legal knowledge he ever had. Now he just sounds like a guy who knows he’s going to prison, and has no idea how to respond to it.